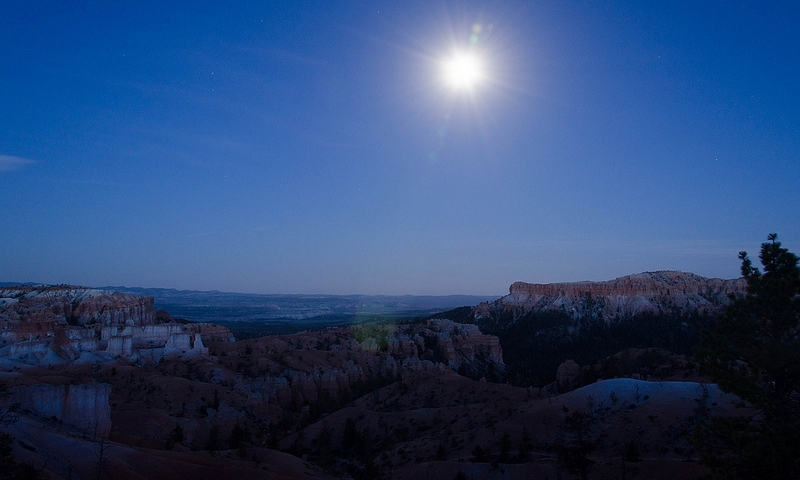 Celebrate Bryce Canyon's thrilling nightlife on the Full Moon Hikes throughout the park. These are unique experiences held only during the 2 or 3 nights of a full moon. Descending into the canyon with the mix of shadows and moonlight can create an amazing experience all on its own. Overview: The 1-2 mile hikes in Bryce Canyon are led by rangers that want to introduce you to the park under the light of a full moon. Spooky shadows offer the park a completely different personality than it has by daylight. When: Held over the 2-3 days of a full moon. Check Bryce National Park website for dates and reservations. Fees: These hikes are free, however you must sign up in advance of the hike. There is a set limit of hikers allowed per hike, typically between 30-60 per hike. Details: This is a terrain involved hike, therefore it is not wheelchair accessible. The hike is typically 1-2 miles round trip and require each hiker to sign up in advance and agree tot he hike rules. Attendance is capped at 30 people per hike. (25 for snowshoe hikes when offered). During Summer they usually offer 2 concurrent hikes each night. Children under age 6 are not permitted. Flashlights, headlamps are not allowed. Flash photography may be permitted under key restrictions. Bring drinking water and jacket (evenings are cool). Due to steep and rocky trails this activity is not wheelchair accessible. The number of visitors on hikes is limited for safety reasons. Spring, Summer, & Fall Seasons Tickets - Tickets for the Full Moon Hike will be distributed via lottery on the day of the hike. Each person in your group must be present at the lottery with the hiking shoes/boots they plan to wear. Once your footwear has passed inspection, ONE lottery ticket will be issued per group. The Ranger giving you the lottery ticket will write the number in your party (maximum of 6) on the back of your lottery ticket. If your lottery ticket is drawn, only the number of people written on the back of the winning lottery ticket will be issued hiker tickets. Winter Hikes are done by snowshoe and hikers must sign up in=person on the day of the hike. Contact or visit the Visitor Center Help Desk for more information about time and location of lottery. Help Desk phone number is (435) 834-4747 or email brca_information@nps.gov.